The Grave of Saints is a tomb located halfway down the deep pit in Majula. 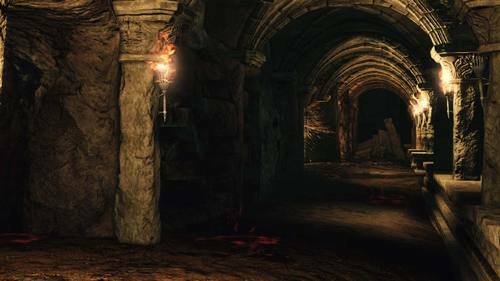 At one point, it may have served as a resting place for Drangleic's holymen, but has since been overrun by rats. The Grave is one of the Rat King's domains and, as such, trespassers will be summoned to the worlds of his subjects to be dealt with. Undead Prisoner: Ubiquitous, unarmed and unclothed Undead whose journeys were cut tragically short when they went Holllow; their corpses can be found throughout Drangleic still clutching the various items they carried. Those not yet fully dead are often dormant when first encountered, and in such cases they will stand to attack only when their attacker alerts them to his or her presence. Corpse Rat: Corpse-foraging giant rats. While at first glance they appear to be no more than putrid vermin, these sentient rodents are in fact loyal subjects of the noble Rat King and will bravely defend their subterranean kingdom against intruders. It is whispered that those who demonstrate their integrity may be granted an audience with the King and, if deemed worthy, initiated into the ranks of righteous rats. Undead Citizen: Former citizens of Drangleic who were the victims of Lord Aldia's experiments. Their bodies are horribly disfigured as a result of the unspeakable procedures to which they were subjected, their life forces now sustained by unstable and highly-volatile Souls. Rhoy the Explorer (Dark Spirit): Rhoy is a member of the Rat King Covenant. He is wearing a suit of transparent armor, and both his weapon and shield are invisible due to the rings he wears. Royal Rat Vanguard: A servant of the Rat King tasked with overseeing the Grave of Saints burrow and testing the worthiness of those who seek an audience with his lord. This loyal rodent can be identified among his subordinates by the dark ridge of fur on his back, perhaps a symbol of his status in the underground kingdom. Grave of Saints is a part of Tomb of Giants. It is possible that Grave of Saints is either Tomb of Giants from Dark Souls 1 or at least part of it. Note: the developer specifically stated "The game is set in a different part of the same planet". 1. Along the Grave of Saints are several giant skeletons in tombs. 2. Both locations are underground. 3. Behind the Rat King is found a giant skull exactly like the Tomb of Giants. 4. Next to the Rat King is found a giant hanging skeleton. See Polygon.com blog "Dark Souls 2 developer: If Dark Souls was set in the North Pole, this one would be in the South Pole" (Can't add link because of low Karma). Additionally I wouldn't see any relation between both places only because a level designer resicles objects from Dark Souls in Dark Souls 2. Another interesting note from the interview was "Time is one of the central keywords we're keeping in mind as we create this." So, even though the two places may not be the same geographically, there could certainly be ties culturally or otherwise that influenced them in similar ways.